Running is what people do when being chased by a bear, not an activity for fun. This was my belief before May 2015, and no I did not wake up one morning saying I will run a 5k everywhere I go. But this is what I have accomplished over the past three and a half years. My motivation is my amazing grandchildren; they give me focus and strength. Looking back, it all began in January 2015 when my life unraveled like an intricately woven sweater with a loose end. I encountered many stressful and life changing events. I grieved the past and recent loss of my two sisters and father, but the last straw was watching my mother battle the evil disease process of Alzheimer’s. She lost her battle, and I was slapped with the realization that I was the last person in my generation of the family. It was just me, my children, and my grandchildren. I struggled with health issues of morbid obesity and high blood pressure but realized how poor my health was after falling on ice and herniating a disc in my spine. I had significant pain daily with basic everyday activities, even waking from room to room in the house was painful. I knew I had to change my life for the better to be around to see my grandchildren grow up. I retired from a high stress job in the IT industry of 40 years, completed a round of physical therapy, and accepted a challenge from my granddaughter to join them on a “Girls on the Run” 5k in May 2015. What am I thinking? A 5k? I can’t do this. Why would I say yes? I had many doubts and excuses, but that was just it. They were only doubts and excuses. I had accepted the challenge, and now I would run side by side with them. First, I had to get in better health, and start running! How could I run when I had pain from walking 15 steps across the room? Where do I begin? All my life I was always a planner, but now I didn’t even know where to start. My daughter and son-in-law lugged me to the gym every morning and encouraged me to complete the workout they found appropriate. I felt like they were trying to get to their inheritance early. But day after day, I was becoming stronger, and the pain was disappearing. I then realized they were helping me keep my challenge promise to my granddaughters. These workouts became a challenge to lift heavier weights than my daughter, walk farther and faster than the day before, and eventually, it all led to running! YES, you heard that right! RUNNING! At 59 years old, I was running for the first time in my life. In four months, I accomplished the impossible. I could barely walk, but now I can run. My life has now changed from the 59-year-old morbidly obese man that has smoked for 40 years to running most days of the week. 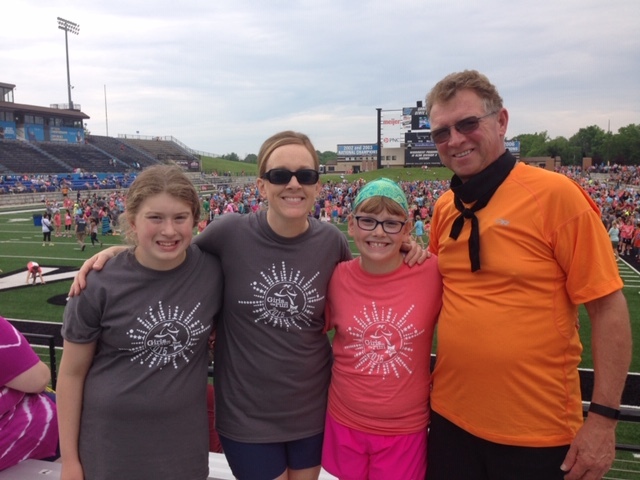 I still couldn’t believe what was happening; I just knew I made a promise to my young granddaughters and I needed to cross the finish line with them. Race day, I crossed the finish line with my granddaughters and daughter-in-law. I felt proud of what I had accomplished and knew right then this was not the finish line, but only the beginning. I made a promise to myself from this day on I would stay healthy to be around to make many more memories while growing up with my grandchildren. I felt young and carefree while running and didn’t want these feelings to end. I retired in November 2015. Now, what to do in retirement? I thought long and hard about what I wanted to do. I decided to get rid of my “sticks and bricks” house and bought an RV. I set out with a new-found love for the road. On six wheels and towing a Jeep, I wanted to take time to see the great American countryside, cities, and landmarks. But after taking up my recent hobby of running, I decided the land is best seen with the repetition of pounding pavement and the sounds of my environment. I found that I could reflect on my life and journey while being one with the quietness of the countryside or bustle of the busy big cities. I decided that I would travel through each of the 50 great states of America and hey by the way why not run a 5k in each. Yup, that sounded like a good plan. I believe that everything happens for a reason in life. I started in Michigan, my home state, where I met and ran alongside a gentleman, Rob Swartz. 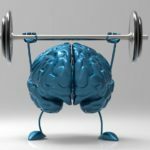 He suffered from a rare brain disease, received extensive brain surgery and treatments from the Mayo clinic, and continued to run races after his recovery. 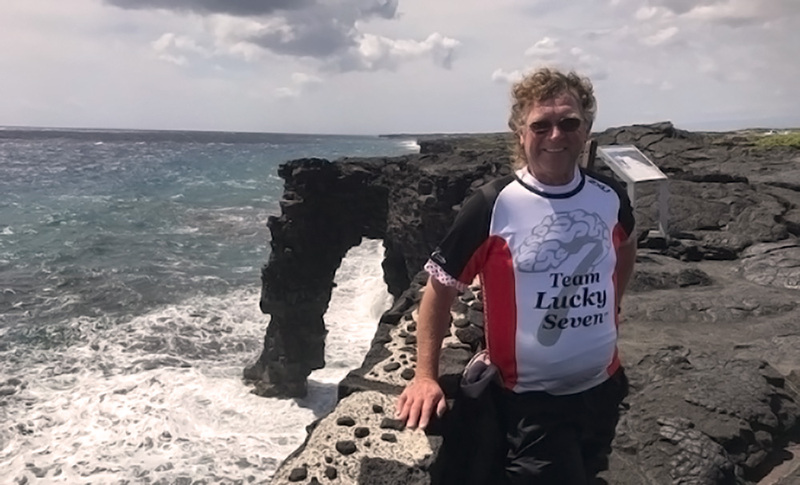 He was only the seventh person in the US to be diagnosed with this disease. 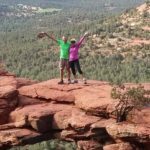 He and his wife Dani created Team Lucky Seven (a 501c3) to raise money and pay forward the benefits from the Mayo Clinic. Rob invited me to join his team. 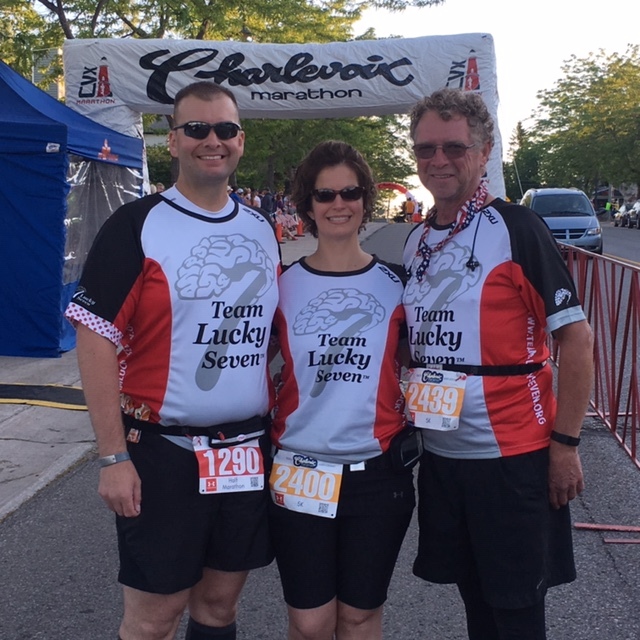 I became the seventh member of Team Lucky Seven and started runing to support Brain disease research in honor of my mother and her battle with the evil Alzheimer’s disease. Throughout the next two years, I completed a 5k run in each of the 50 states including some of the most memorable, scenic, iconic, and historical locations. 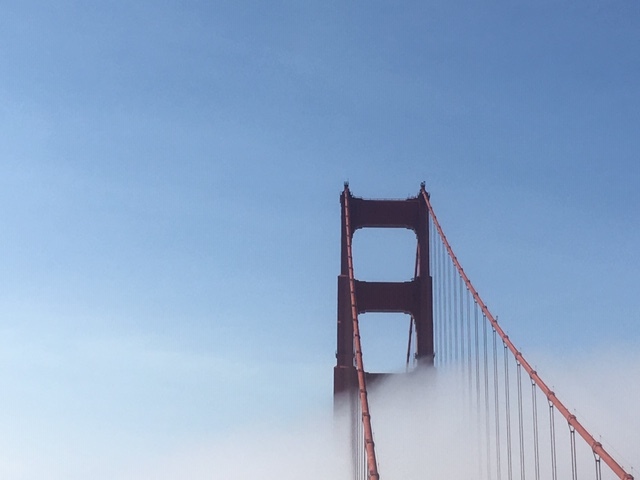 I have experienced a heart pounding, and adrenaline filled run across the Golden Gate bridge with traffic whizzing by and the Pacific Ocean breeze in my hair; while the fog was lifting to expose the suspension towers on the bridge. It was surreal to take a leisurely jog through the iconic and only green space in New York City Central Park knowing I was in the middle of the busiest metropolis city in the US. It was exhilarating to run elbow-to-elbow through the Las Vegas strip at midnight beneath the glow of the neon lights from the marquis above and ending the run at the Nine Fine Irish pub for a pint. During a mid-afternoon run around the National Mall in Washington DC, I thought maybe I had seen Captain America pass me. During a run in Death Valley Badwater Basin, I wondered if I would become vulture food as my feet became 100 pounds each while sinking into the salt brine. I thought only a mile and a half to go as it was 80 degrees at 7 am. I was there all alone and no potable water in sight. As you can tell, I made it back, but still had my doubts. 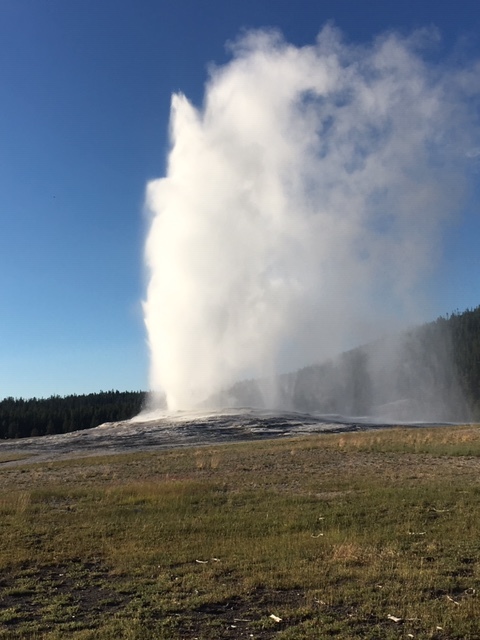 Geyser Basin Yellowstone was an early morning run without headphones but loaded with bear spray in each hand, just for my protection. I had the opportunity to run a track usually only traveled by race cars. As I ran along the track of the Daytona 500, I could hear the whispers of the cars that recently exited the track. The smell of racing fuel filled the air and gave me the strength to reach my full capacity. At 10,678 feet I ran the ridge trail in Sandia Peak New Mexico with oxygen in my hand. Breckenridge Colorado was challenging as it was only 32 degrees and windy at 9600 feet above sea level. But above all the people I have met along the way have been the biggest influence in continuing this journey. In Annapolis, Maryland I had the honor to run side by side with a young Marine who lost both legs from the knee down in combat. He ran with pride on spring prosthetic feet and conversed about fighting for what you believe in and defending your country. I have had many encounters throughout this journey that have taught me a lesson in life. This is one lesson I will not forget. In a total of 2 years and four days, I completed all 50 states with Hawaii being the last. I had planned to run a 5k, but after being present for the finale of the Ironman in 2017, I decided to push harder. 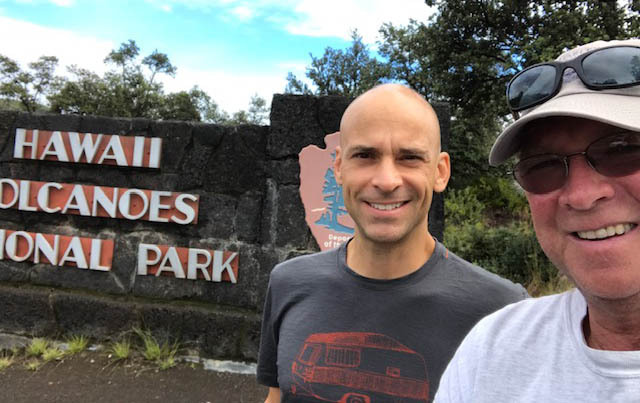 I was with a friend and joined him at the last 10k of his marathon to finish running the crater rim of the Mauna Loa active volcano in Hawai’i National Park. I have since completed my first half marathon over an international border crossing of the Windsor-Detroit Bridge and an under water run of a mile back into Detroit through the tunnel. I have learned through this journey to live each day with the fullest intention, trust your instinct, don’t live with regret, and talk to people- you don’t know what you can learn from them. Life is full of surprises, even with the best laid plans, it will open doors and roadways filled with unexpected surprises. 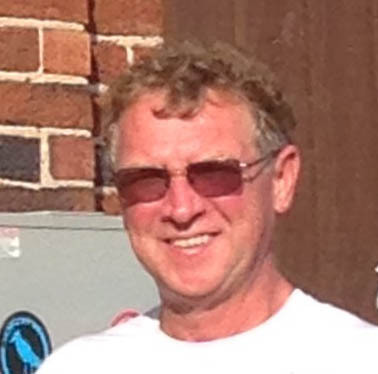 Mark is a 64 year old single male, from Grand Rapids, MI., he has has 2 children and 6 grandchildren. 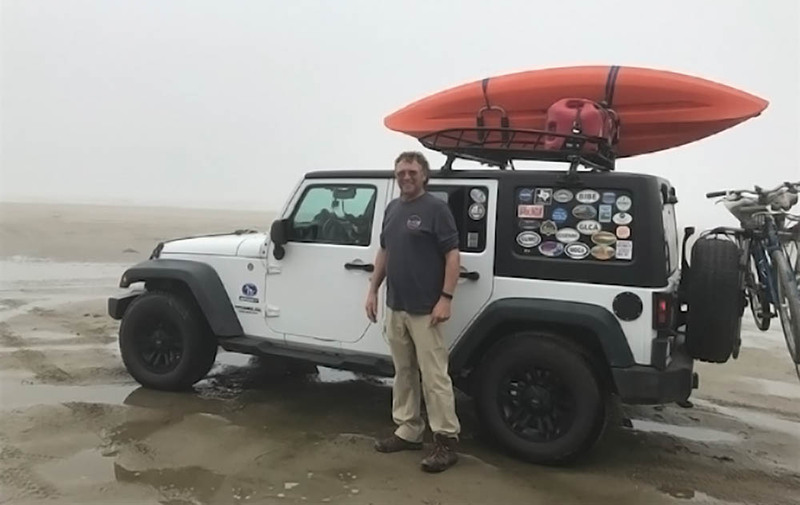 He retired after 40 years from the IT industry, upon retiring he took up a nomadic lifestyle, traveling full time and living in motor coach the past 3.5 years. He’s traveled all 50 states and run a 5k/10k in each state. He joined Escapees, July of 2017 in Alaska while attending his first convergence, he continues to travel and attend convergences. Wow! Mark your story is wonderful. How inspiring. Thank you for sharing your adventure. Fabulous write-up Mark! So glad our paths crossed at that Convergence in Alaska last year … sorry, year before last! Time flies! Looking forward to cheering you on when you come to the UK to run a 5k here too. Our front door will always be open for you! Hi Mark, Great story! Jeff and I feel lucky to be a couple of the people you met on your adventure! We have enjoyed following your travels. I hope you write a book. We are still RVing. Maybe our paths will cross again. Until then safe travels. Jeff & Shelley Hollis. that’s a lot of miles! Both on your RV and you! Totally awesome! Your story is wonderful. I have been a runner since I was 50 years old. I am 62 now. I am working on running in every state, 23 so far. I am retired and thinking about buying a RV and becoming a full-time Rving. I still have fears about traveling by myself. I been doing a lot of research on RVing full time. I hope to try it next year. Keep Running….